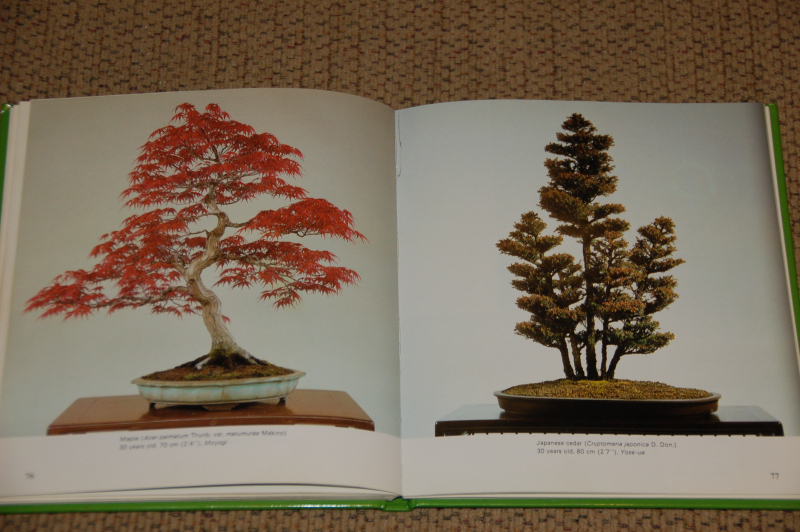 I came across these books at the local bonsai shop. I purchased them in 1994. These books are from the 1991 printing which I think was the first printing. 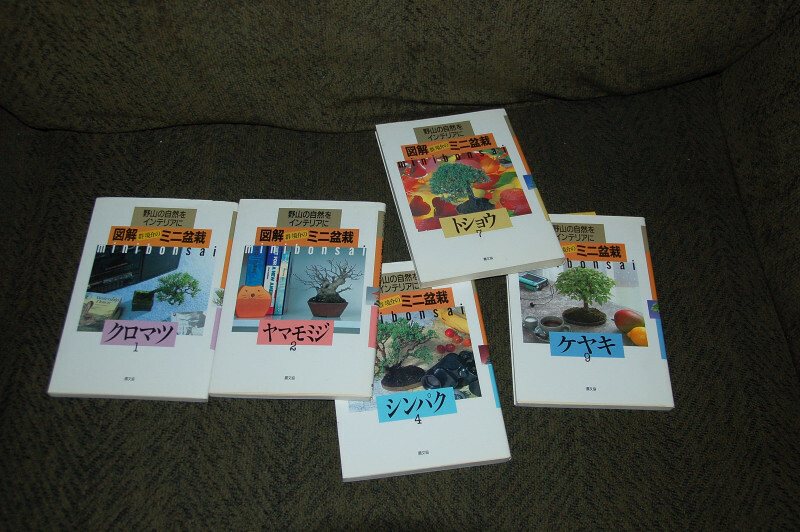 The books are in Japanese and although there are ten books in the series I have only five. The reason I have only five is that the ones I have are the ones I found most useful for my climate and on the trees that I find thrive in my climate. These show up from time to tume on ebay and are about $35.00 a copy. They are worth the money if you can find one in the USA as the shipping from Japan makes a copy about $50.00. The second photo is also by Gun and is a best of with projects from all the ten books mixed in a single book. Very cool seeing some of the projects. I was a very lucky fellow. 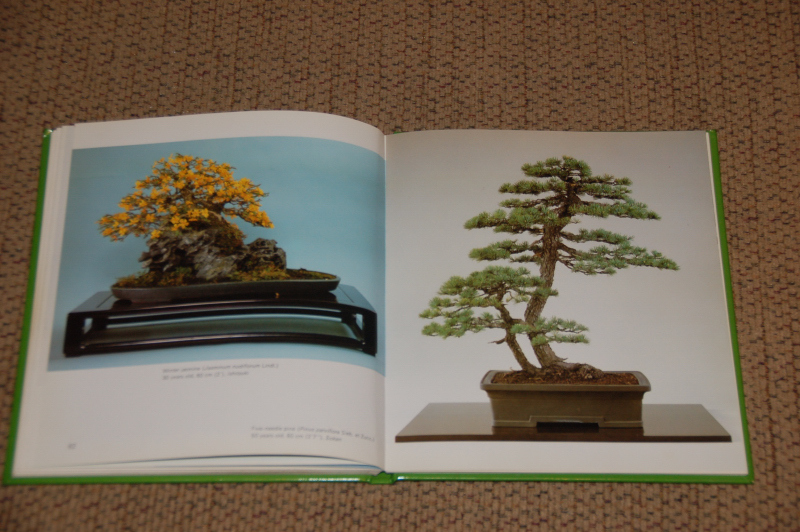 My first bonsai book was one of the best books still written today. 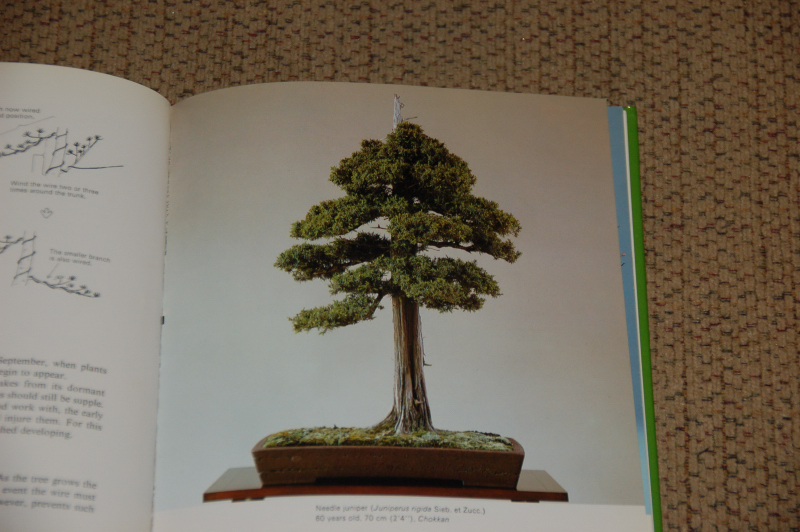 It is a simple book, not very large, being only 8″ by 8″ and just a little over 1/4 inch thick. Hard cover with a good binding. 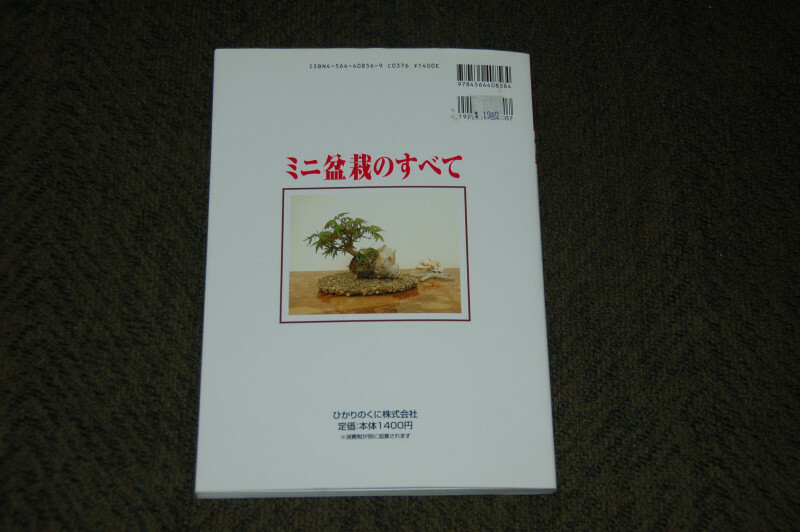 The book is written in Japan and contains pictures of very good Japanese bonsai. 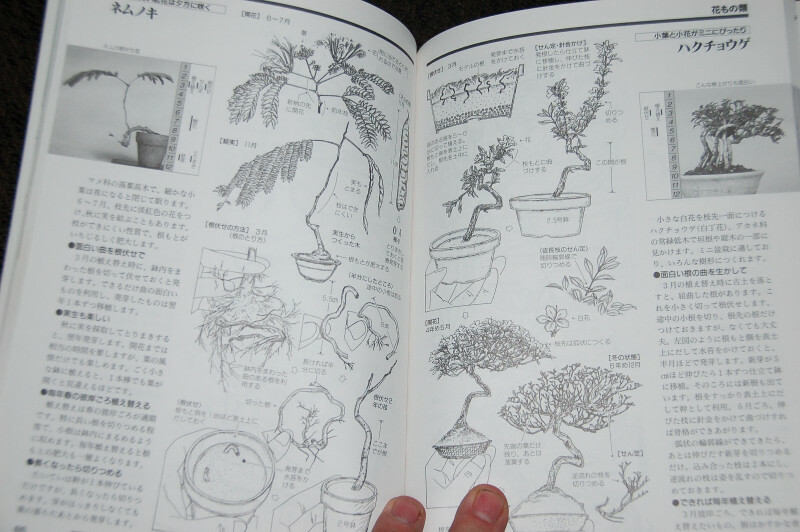 As I went along in bonsai I wanted to own every book I could find. I found a lot and I gave away a lot. Most of then were just crap. 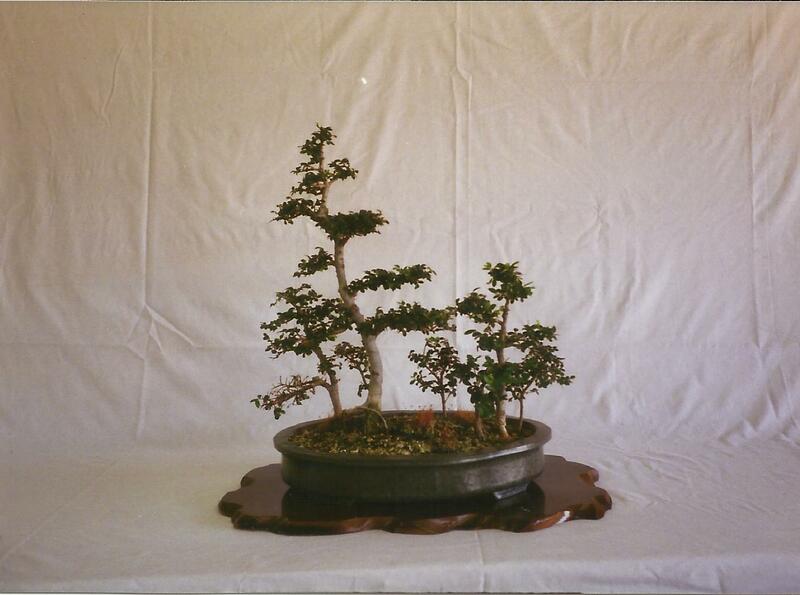 Poor pictures of bonsai not very well developed and as I look back now how uninspirational they were. 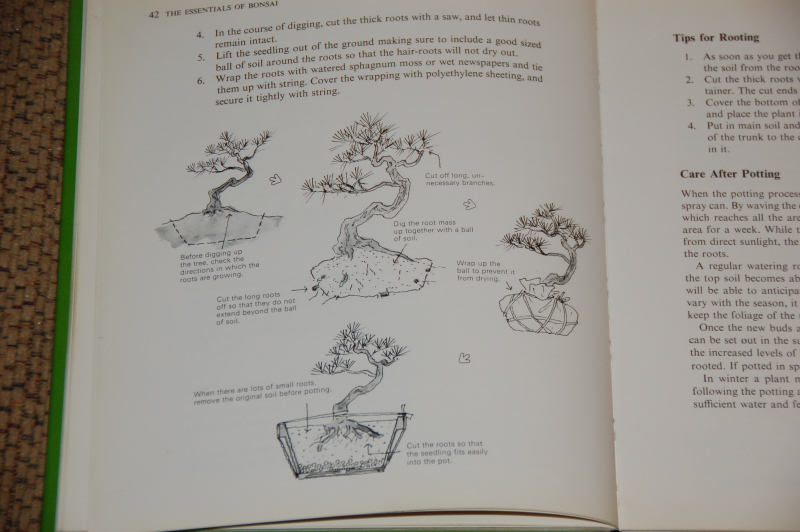 This book covered all the basics, wire, shaping, layers, dividing, grafting and did it with very good drawings. 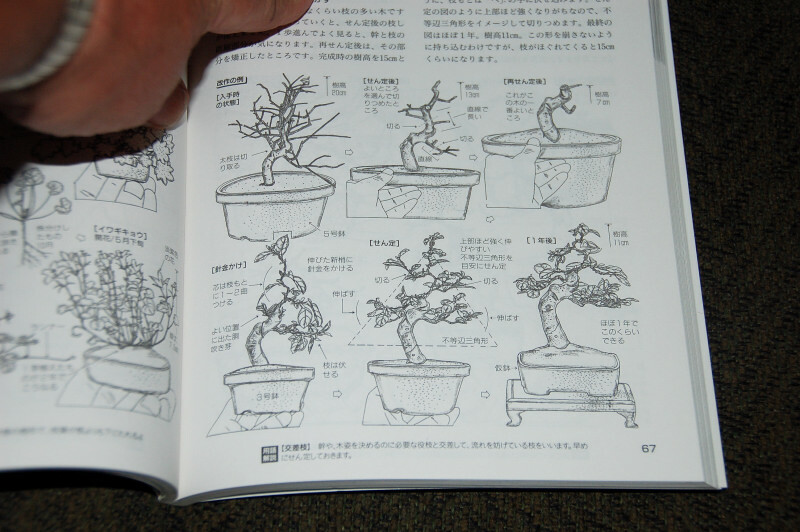 It covered all the forms and how each one should look with a quality Japanese bonsai showing the form. 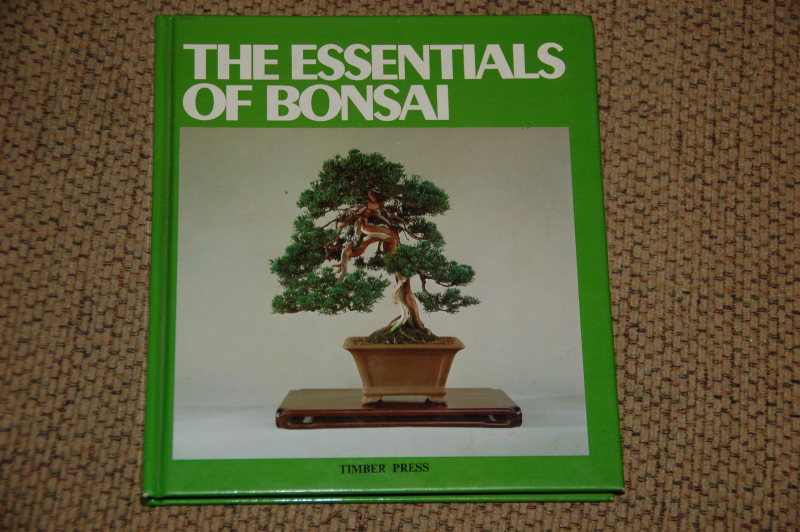 In a lot of ways this book paved the way for my thinking in bonsai and showed be from the beginning in an era void of the internet, and unknowing of the bonsai world around me. I purchased this book in 1984, but this printing is from 1981. A book truly ahead of its time. Find a copy on ebay its still one of the best reads out there. Even if you think you know everything, i’ll bet you will read something in here you didn’t know. 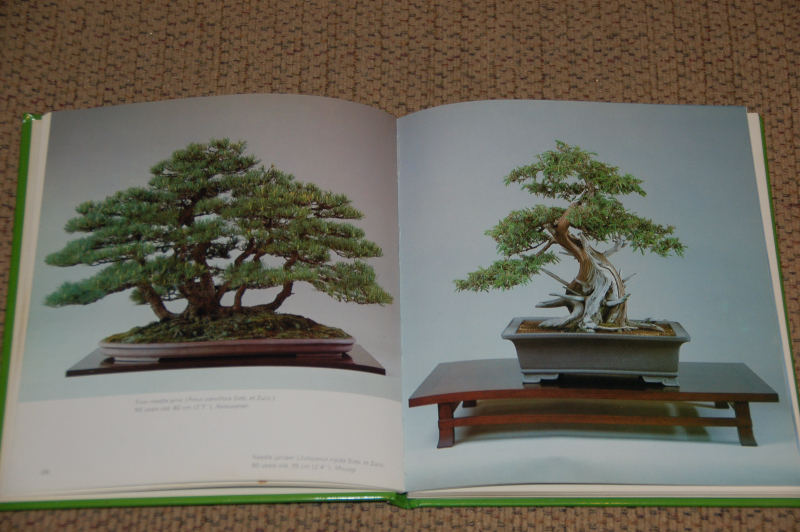 This first book I bought had an iconic bonsai in it, one that would stay with me for many years. 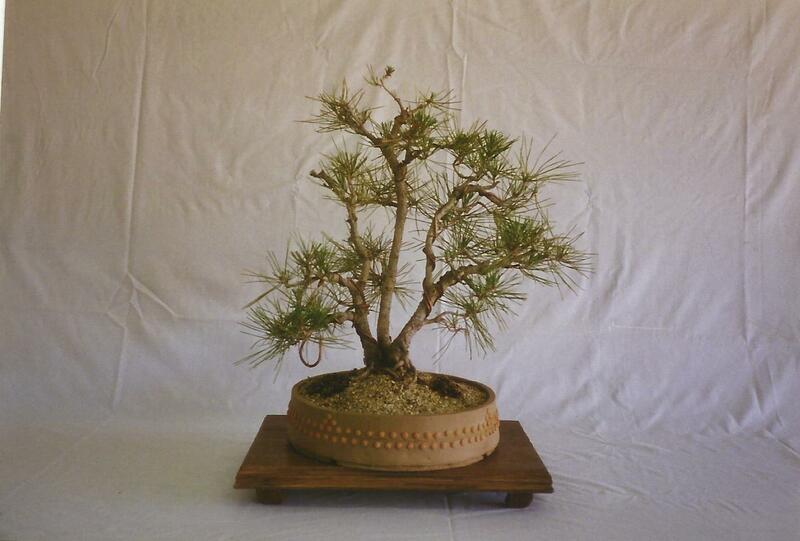 I was picture of a needle juniper. 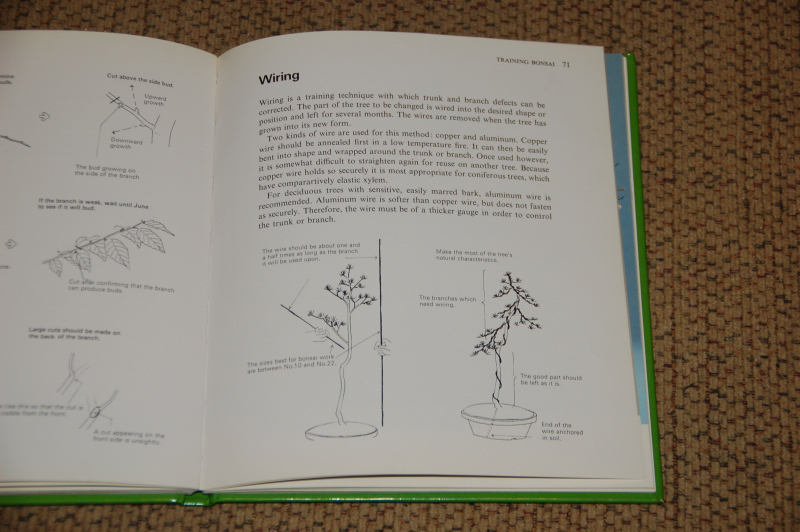 The drawing of how to do things like wire and collecting were superior. The movement in the wire drawing is just the way one should wire. The drawings on collecting show a craggy twisted pine taken from the mountains, something worthy of collection not just because its free. As I write this ebay has several for sale, one, a “buy it now” for $3.97. Worth it just for the pictures alone. 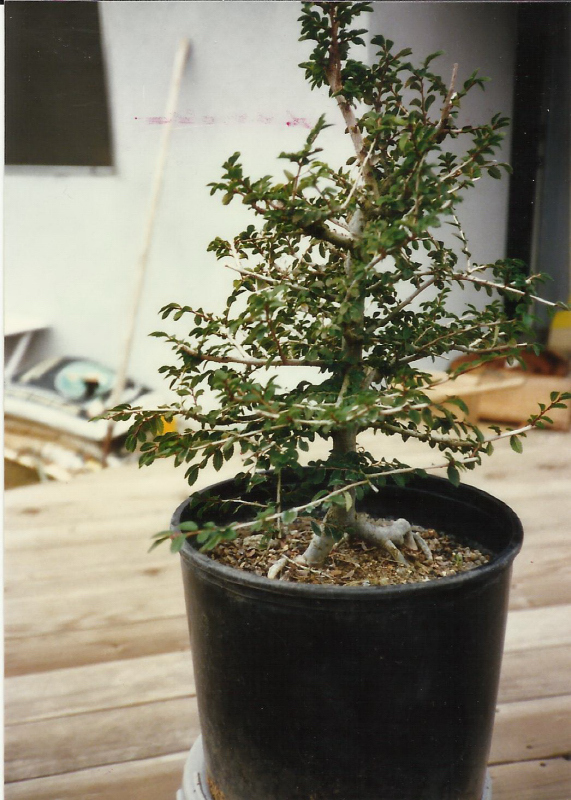 I started bonsai in 1984 and my first trip to Muranaka Bonsai nursery was in 1986. I was amazed at the material there. Mind you I had no idea how to pick a piece of material but I had fun trying. Some may ask, “Al, why do you show so many of your clunkers from years gone by?” That is a very good question. The answer is simple, it reminds me of where I came from. 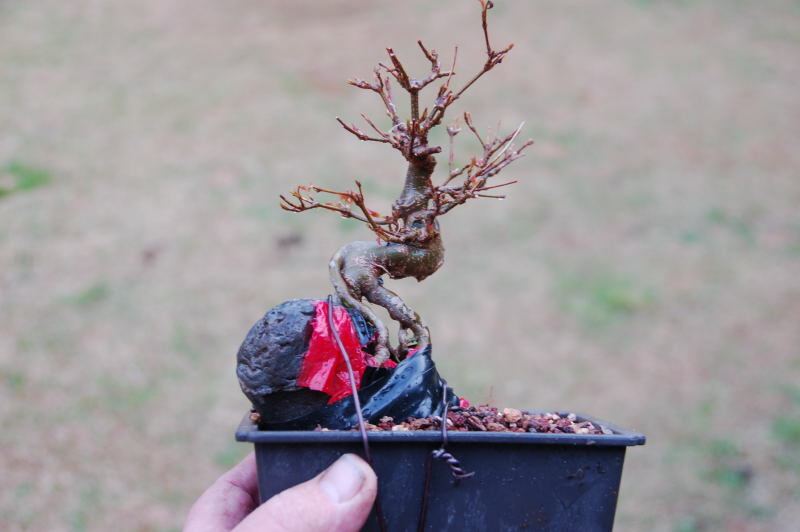 Many times I find myself stopping short lately on the keyboard when a newbie displays his first tree to turn into bonsai. I am quick to ask “why did you buy that?” I now know the answer because before this blog and Throwback Thursday, many of these pictures were on film, printed and in albums in a book-case with dust on them. Guess I need to dust the book-case. As I look back thru these albums for nuggets of humor to post I am amazed at some of the things I purchased in the name of good material. 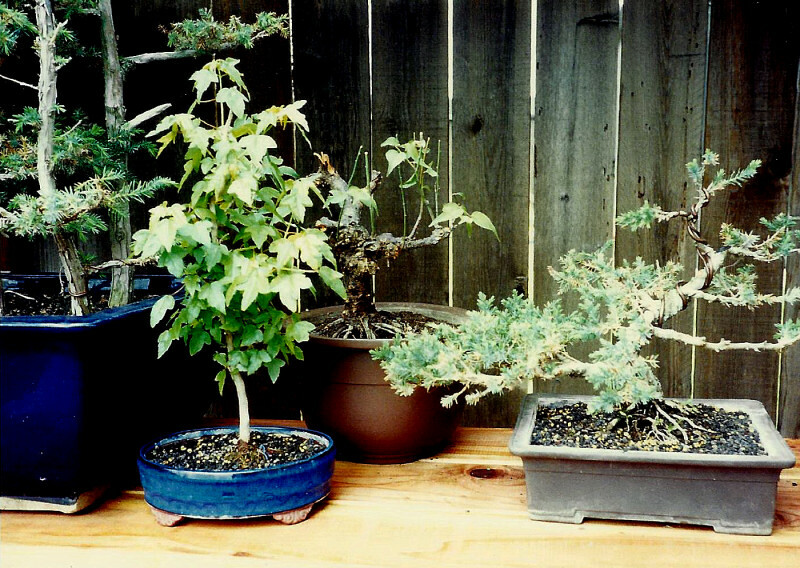 So, with no fanfare, here are a couple of purchases from the year 1986, two years into my bonsai career. The trees couldn’t be more different. A nice Chinese quince and a Chinese elm. My wife and I of only two years were staying in a Hotel in Pismo Beach California. I was soaking in the sunset with my two new trees on the deck of the Hotel. While the quince had some damn nice lines, I have no idea what happened on the choice of that elm. 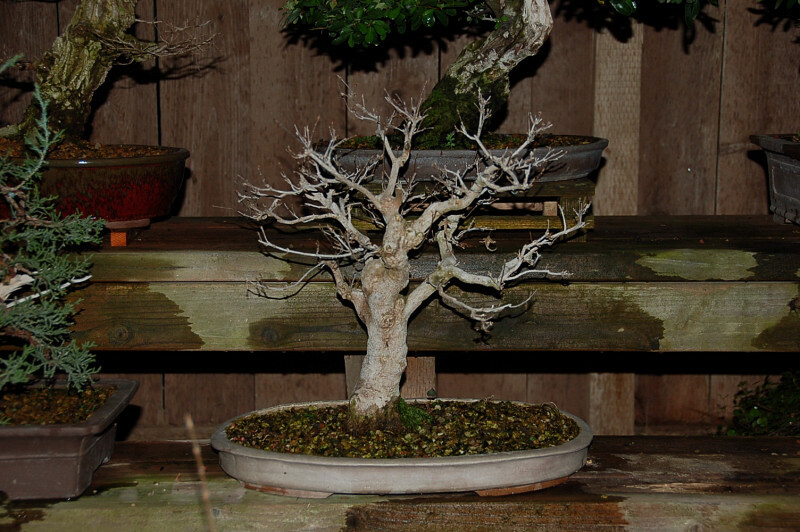 You will notice that the first thing I did when I got home was put it into a plastic bonsai pot….way cool. Check out that ripped body and brown hair. You all have to know how much it pains me to share this photo. You couldn’t grow a more symmetrical root Wye if you wanted to. 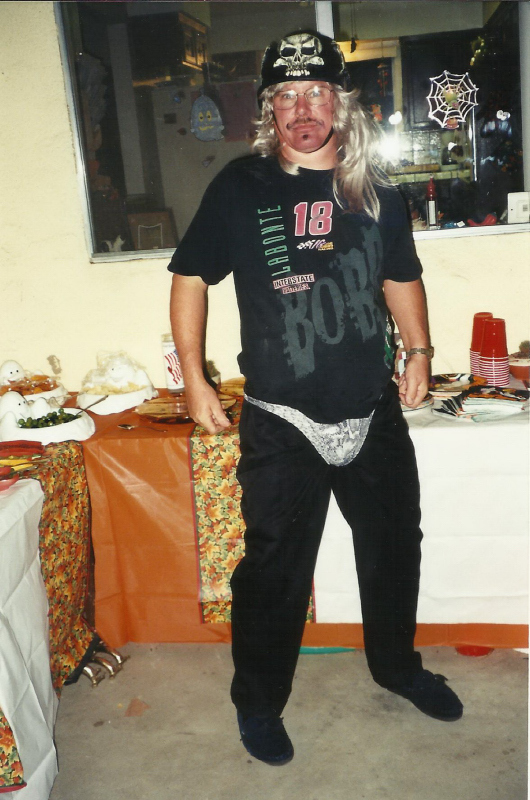 My wife refers to me as thumper…..lock up your women folk! The year was 1993, my son was a junior in high school when he took ceramics for the first time. He came home with terms like “wedging clay’ “the slab roller” “bending cones” I began to wonder just what kind of class this was? 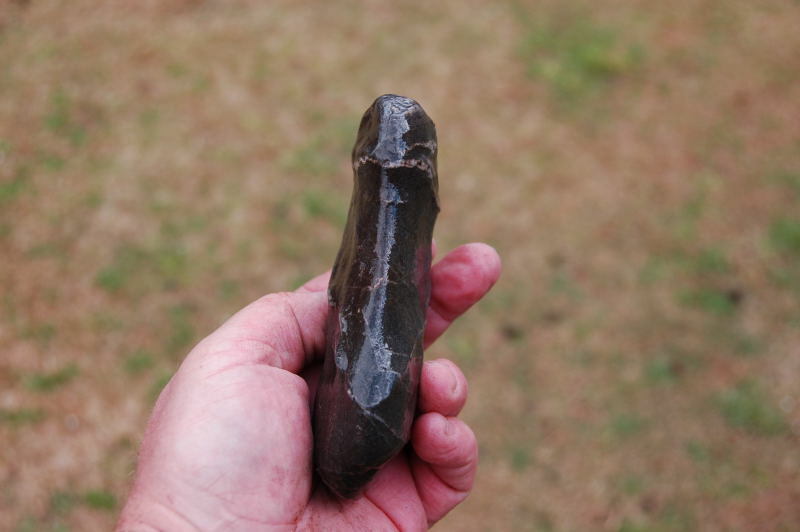 I knew nothing about how to make a ceramic pot and when my son first mentioned it I was a little skeptical. I remember my first projects in grammar school and playing with clay and the multitude of “ash trays” all the school chums made. He did make me some pots. They were damn good too. In all he made me about twelve pots. Some were very large like the blueish one in the photo below. 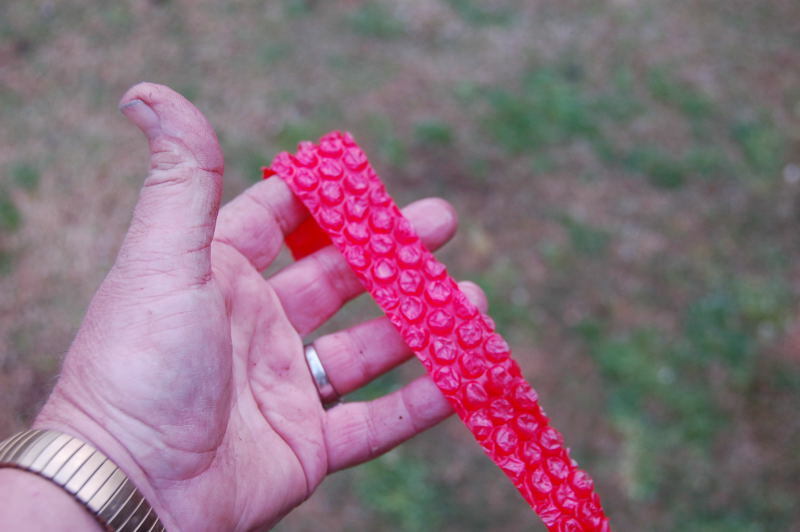 It was about 22 inches wide and about three inches tall. Nice pot and I wish I had all of them back. Many of them were sold with the tree in them. This is the largest one. It had a glaze on it that looked like metal and was mottled colors of blue and green. I put this elm group in it. He made this drum pot. I did not own a drum pot of this quality. I could not figure out how he made the rows of nail heads so well and made the small pyramids of nail heads at the quarters. The nail heads were also of a different color clay. Of all the pots he made I wish I had this one back for sure. The tree…not so much…. This pot was glazed in this white color. It is the only pot I have from his high school days. I cherish this one and will try my hardest to never let this one get away. It houses my Wizard of Oz tree that was started from seed by Ed Clark in 1981. I have a lot of pots in the attic of my garage and have not looked in those boxes for a long time. I need to check them out, there just may be a shohin sized pot from my son in there. Now wouldn’t that be just peachy. 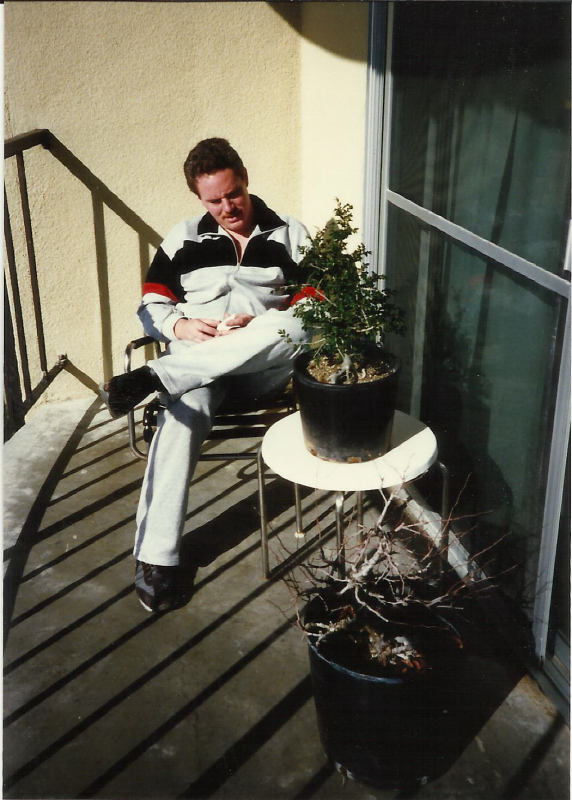 The year was 1992, I had purchased many maple trees but had bever tried a trident. 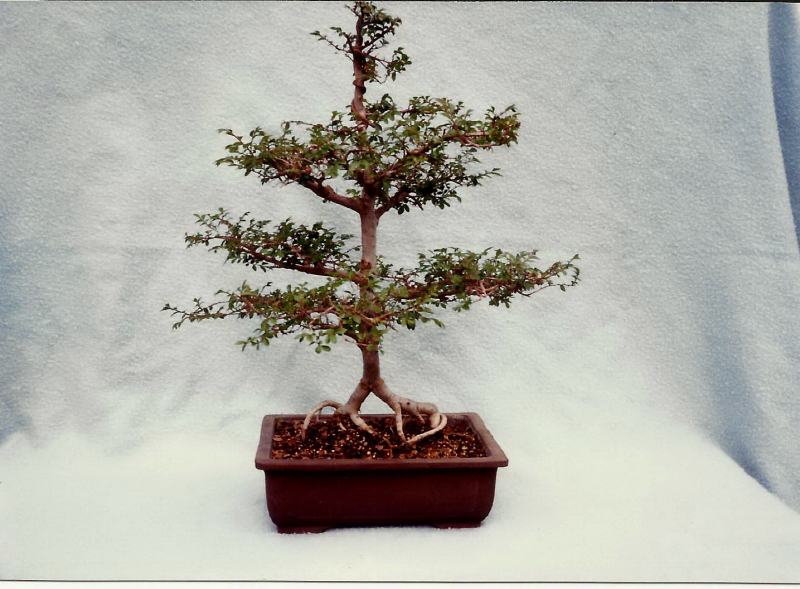 They are not a tree you just go down to the local box store nor nursery and purchase as bonsai stock. I do remember seeing some landscape trees that were seven feet tall, but had rather thin trunks. I found a source for trident maples locally at Henderson Experimental Gardens. I purchased my first trident maple here and would go on to return a decade later and purchase five landscape trees to cut down and build large trunked sumo tridents. 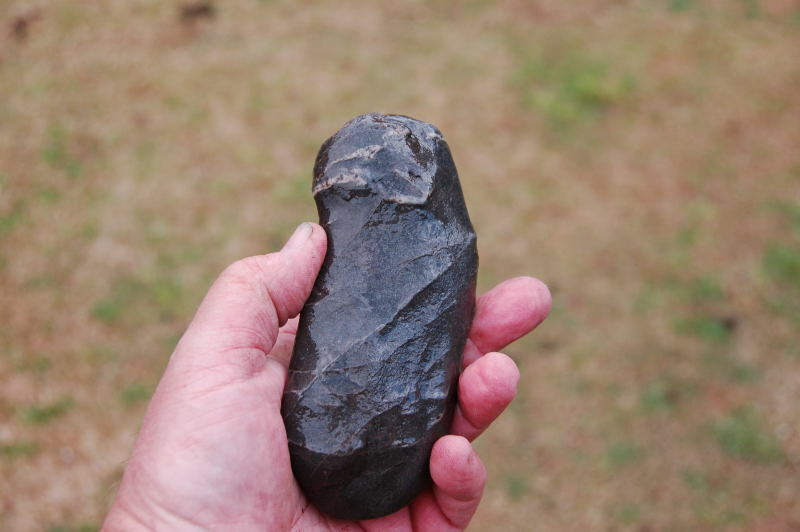 This first trident was the beginning of a love affair with the species in its ability to become any form and accept any technique with ease. 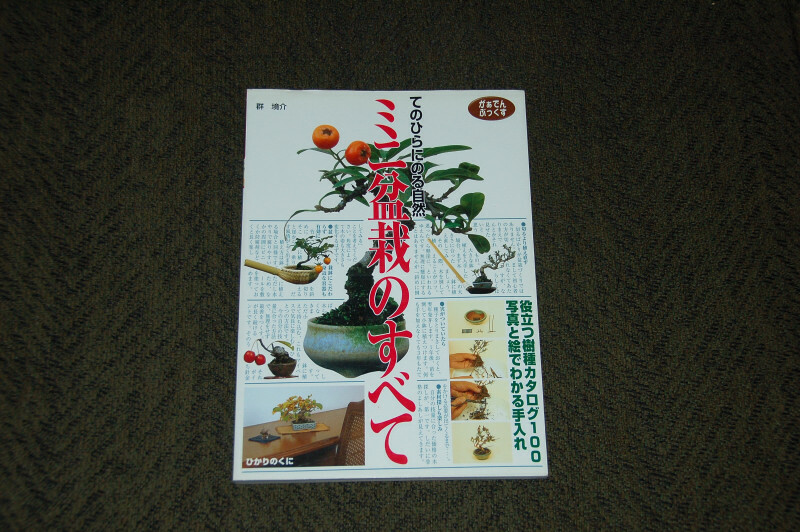 It would grow healthy in any soil, disease free amd great for beginners. Over the years I took cuttings, started seeds, dug them from field growing collections and purchased them throughout California. At one time I had over 125 trident maple trees in my backyard. That is too many trees for a fast growing species that this is to take care of. The collection is now pared down to a managable level of about 40 trees. Thats about 30 too many. 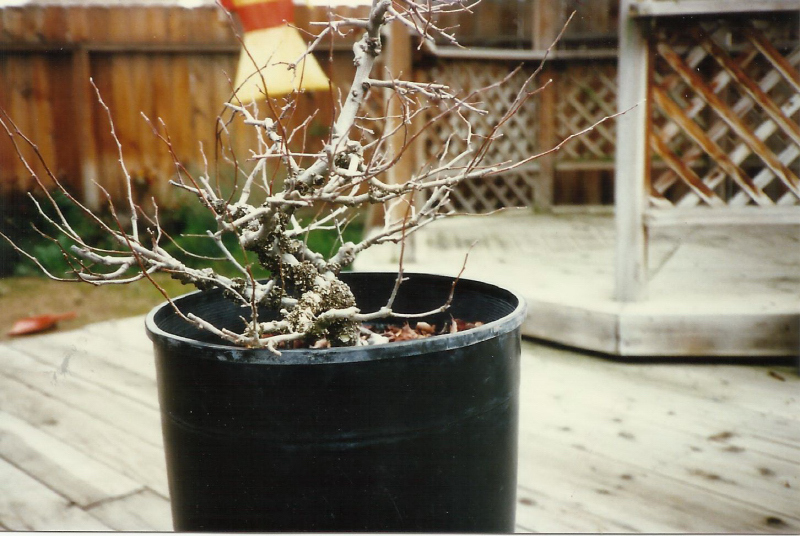 So here it is, the tree that started it all…the first trident maple. I must apologise, but due to this being the first Thursday since Christmas in which I missed a Thursday, and then New Years I went back for more surgery. I am well now and I wish to make it up. 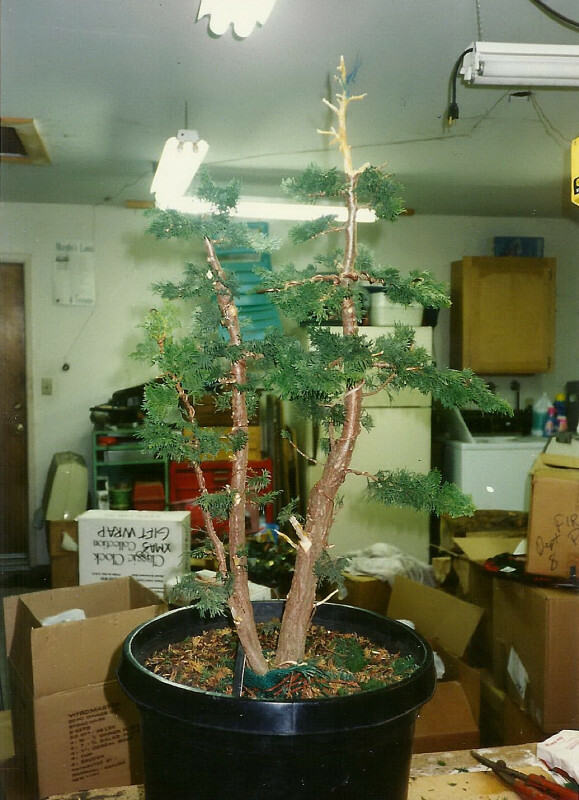 This is the pics of the first Hinoki cypress I ever had. 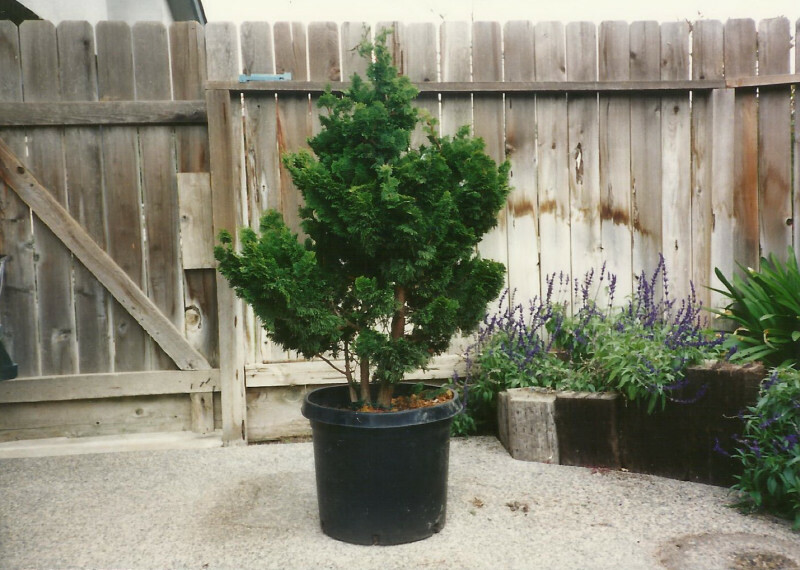 It was also the last Hinoki Cypress I would ever have. While the species is beautiful and I wish I could keep them, my summer heat turned out to be just too much for the tree to handle. I received the tree from my wife for Christmas 1993. 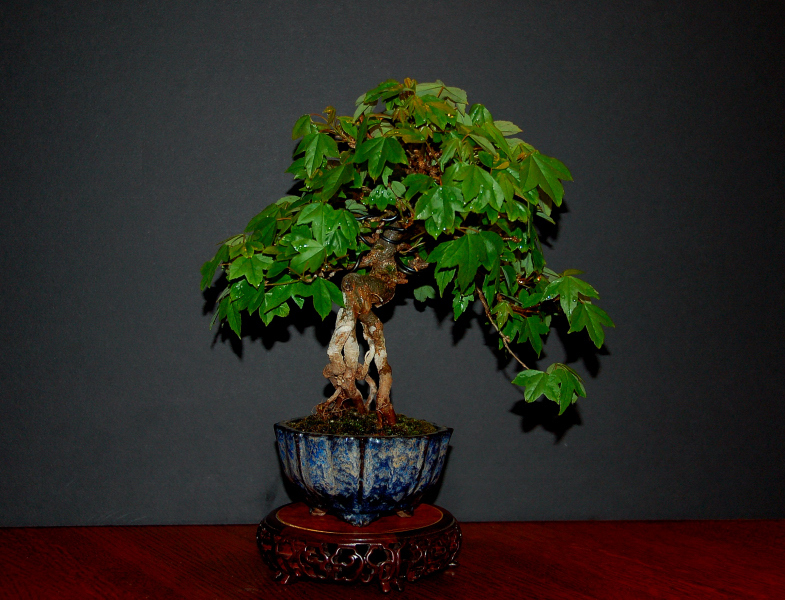 That year she spent a bundle on bonsai stuff for me , buying three Tokoname pots and this tree. I had seen the tree a few weeks prior in a nursery. The tree came balled and bagged in the 20 gallon nursery container. I think it was marked about $135.00 dollars if I remember. I began working on the tree and did some jins and a jinned top. The tree had three trunks and I wished to utilize all of them. During this time I was not much into wiring every little branch and it showed in this tree. 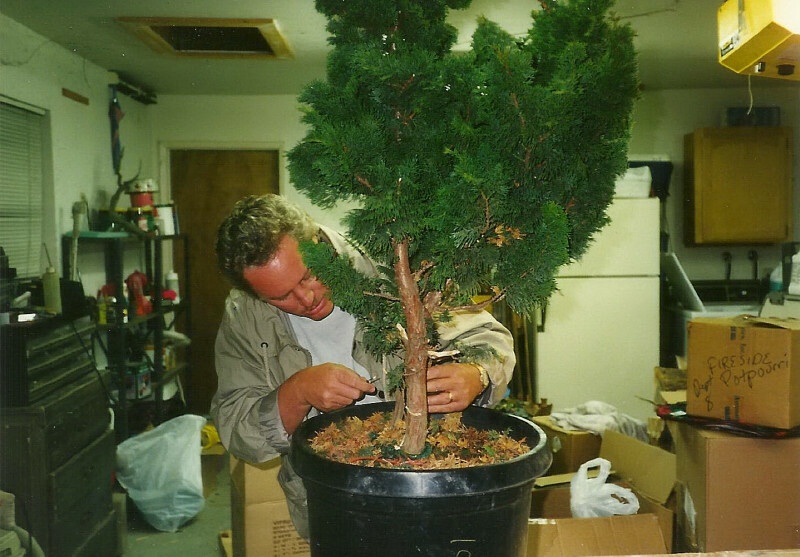 I began working on the tree and started with removing lower branches I would not need and turning the stubs to jin. 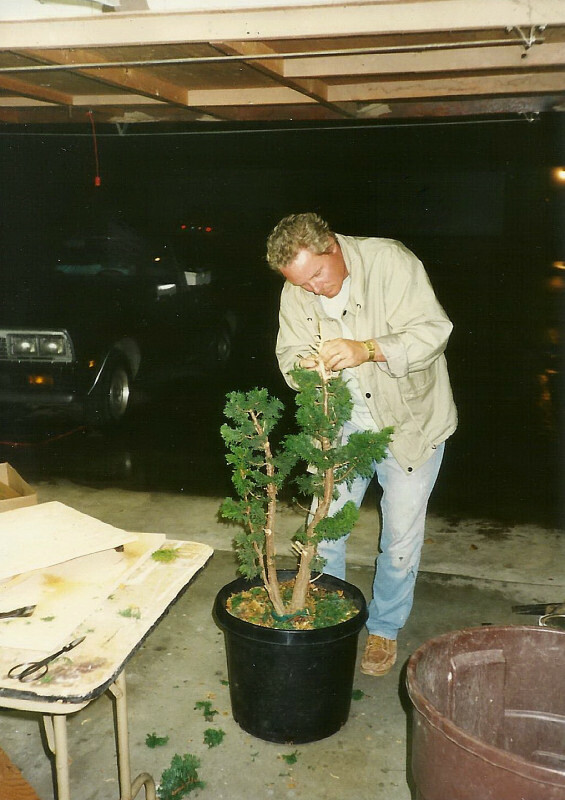 Working on the tree in my garage at the time. 38 years old in this shot. Slim build and fairly brown hair still, what a stud. The tree is starting to take shape and looks more bonsai like now. In the spring the tree was potted in a pot I purchased at a drug store. The small drum pot on the companion plant is a pot made by my son. He made lots of pots for me in the 90’s. I wish I had some of them back that I sold when I was into saltwater reef tanks during this time. 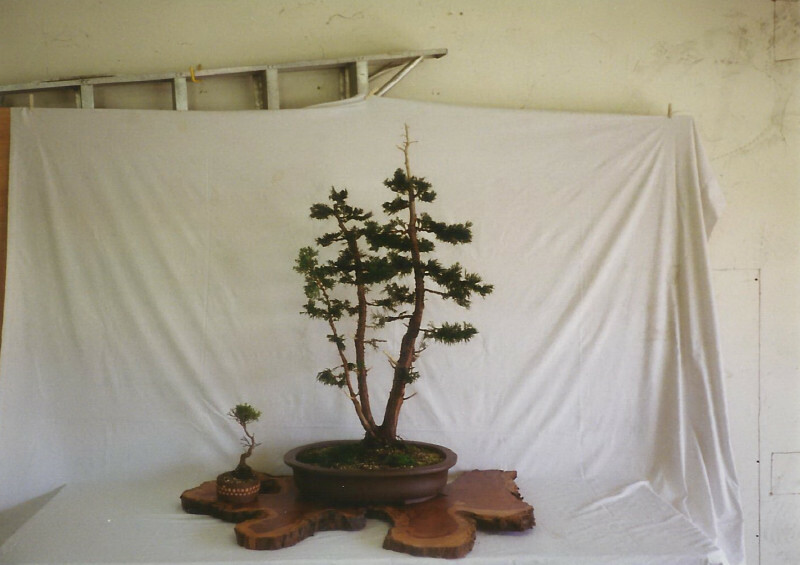 In spring of 1994 after the repot it was shown for the first time at a Fresno Bonsai Society exhibit at Fresno city College, the last time we would exhibit there. 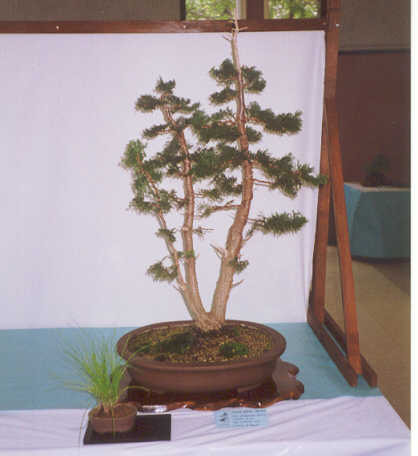 Right after this exhibit I would also join Hanford Bonsai Society as well as Akatsuki, a Japanese driven club in which I would end up as President. 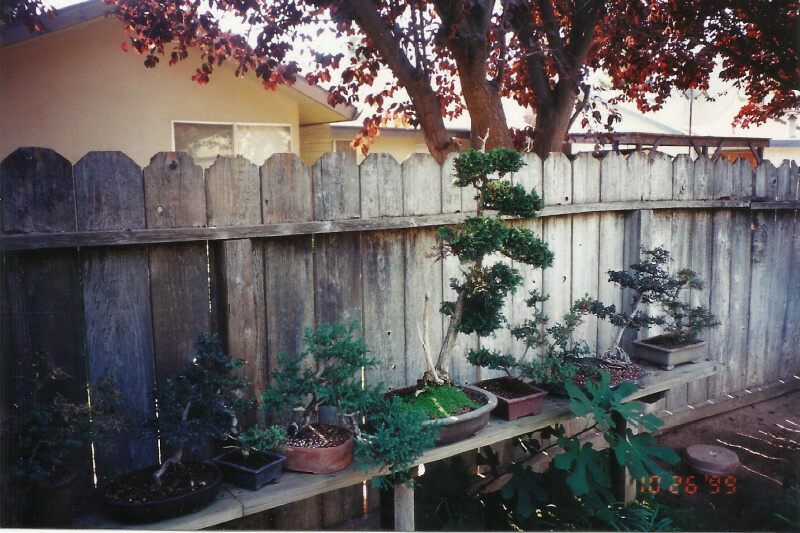 I purchased my current home in 1997 and moved there with the Hinoki in tow. By now two of the trunks had died and I was left with just the large one. I totally jinned the other two and this tree would live for another couple of years and then fried to death in the harsh Fresno heat.